Innovative Photographic Picture Pairs game is a real memory jogger – and path to success right at the start of the new school year. 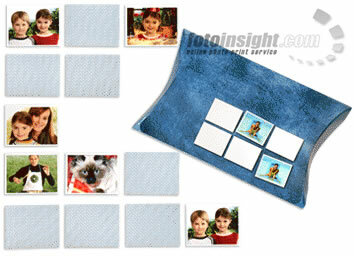 At last FotoInsight’s quality is available in a new group of games designed for the younger set. The online digital photo printing specialist is launching a “Photographic Picture Pairs” game printed from the customer’s photographs. All that is required are 25 digital images (576 x 432 dpi) to make this traditional and original, specially created game. Match the photos to make-up your pairs. The game promotes the mental development, sorting, mental image rotation, matching and the development of memory skills. Encoding, of novel picture pairs activates the perirhinal cortex (a region of the brain) and is a real memory jogger for all ages. Creating a personal FotoInsight Picture Pairs game from digital camera images is as easy as ordering any other photo prints online. Once the user has arrived at FotoInsight’s photo gift ideas section and has clicked on Print Items, a window appears displaying a range of photo calendars and picture pairs game. The user uploads pictures in JPEG, JPEG-2000, PNG, TIFF, PSD, BMP and GIF through browser boxes or simply uploads a complete, compressed ZIP or RAR folder. An individual FotoInsight Picture Pairs game costs £9.99 plus £2.99 delivery within the UK (or €13.99 plus €4.99 delivery from http://fotoinsight.ie/gift-ideas/toys-and-games/photo-memo.html to Ireland and most European countries). Why is FotoInsight Picture Pairs such a valuable game? Creating individual picture pair games from digital images offers much room for creative ideas with holiday snaps, flowers, landscapes and family pictures. A very unique Photographic Picture Pairs game can also be created from 25 familiar faces, like parents, children, grand parents, cousins and friends. According to researchers at the MIT Williams (Williams, A.O., 2001) there is behavioural evidence from infant experiments and studies of prosopagnosia (or face blindness, affecting about 1 in 50 people) providing evidence for innateness of special human face recognition abilities. There seems to exist an anatomically distinct area for quick, holistic recognition of faces. Some scientists suggest that faces might be processed differently than other objects with special difficulties in inverting face images, making a Photographic Picture Pairs game of familiar faces an extremely valuable and unique learning tool. IITM is a specialist agency and will be delighted to arrange interviews for example with founder Klaas Brumann. IITM will be please to provide images, vouchers for review and background information. Keywords: digital photography, photographic gifts, children games, photographic paper, FotoInsight Picture Pairs game, memory training. Cambridge, 13 September 2006. - The latest Digital Cameras come with more features, more complexity - and more opportunity. 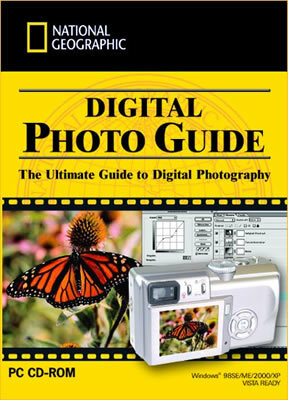 For confused consumers National Geographic’s Digital Photography Guide is the answer, with a complete in depth view of everything from taking the perfect photo to using your computer as a fully functional Digital Darkroom. Ideal for Christmas presents for the budding digital camera or camera phone user. This complete guide, based on the book “National Geographic Photography Field Guide” by Rob Sheppard, is the first step to first class photographs and covers every aspect of digital photography from cameras, memory cards and basic photography to creating truly exotic images using your home computer. Novices can follow a complete Digital Photography course from start to finish and experienced photographers can select a subject for real-time information and useful tips. Unlike a book each subject is supported by demonstrations, interactive examples, virtual cameras, narration and exercises. With the massive upsurge in Digital Camera ownership this guide will prove invaluable. “We are delighted with the National Geographic Digital Photo Guide. It is extremely comprehensive, easy to follow and packed full of information - and who better to show you the ropes! This handy guide is perfect for both amateurs and experienced photographer who want to shoot like the pros. With strong branding, popular subject matter - and the success of our other National Geographic titles - we expect this product to have instant appeal” Commented Jeff Fenton CEO of Greenstreet Software Ltd.
National Geographic Digital Photo Guide is being backed by an aggressive PR and Marketing campaign, plus some fantastic launch offers. The National Geographic Digital Photo Guide is released on 18th September for both PC and MAC with an SRP of £29.99. Greenstreet are a leading developer & software publisher focusing on the sale of top quality, innovative products developed both in-house and by outside parties worldwide. Winner of major Industry awards and accolades for innovation & value, greenstreet creates feature packed products at affordable prices - for Home Entertainment, SME Business & Office Markets - and a well-established test department ensures that only the very best games and utility software gets the greenstreet stamp of approval. Founded in 1888, the National Geographic Society works to inspire people to care about the planet. National Geographic Ventures includes National Geographic Television production and distribution, National Geographic Television International, National Geographic Giant Screen Films, Kids TV, National Geographic Home Entertainment, and digital Media business development, comprising digital Motion, Nationalgeographic.com and National Geographic Maps. NGV creates and distributes content across multi-platforms and media providing outlets for the hundreds of scientific ad expedition-based grants awarded each year. For more information go to nationalgeographic.com.